It seems like everyone in Monrovia wants a whiter, brighter more beautiful smile. And who could blame them? Your smile is an important part of the first impression you make when meeting someone new. But unfortunately, age, eating habits, and smoking can discolor your teeth over time. For this reason, many Monrovia patients choose professional teeth whitening by their dentist. Professional teeth whitening is when a gel filled tray (filled with hydrogen peroxide and bleach) is placed in your mouth for 20 to 30 minutes, depending on the shade of white you are trying to achieve. Additionally, a bright light is shined into your mouth to speed up the teeth whitening process. All in all, professional teeth whitening takes about 1 hour to complete. What About My Tooth Enamel? Will it be Safe? Studies have shown that professional teeth whitening does not harm enamel. But that doesn’t mean your concerns with enamel end there. People will thin enamel on their teeth might not be good candidates for professional teeth whitening. 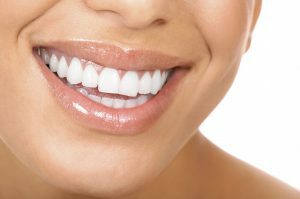 When you tell Monrovia dentist Dr. Q that you are interested in teeth whitening, she will perform a full oral exam, partly to ensure that you have the proper amount of tooth enamel to make professional teeth whitening a safe procedure for you. Teeth whitening is not a permanent procedure. The duration of your teeth whitening results will vary from Monrovia patient to Monrovia patient. Typically, you can expect teeth whitening results to last from several months to up to 3 years, depending on the type of stains you were trying to remove, the thickness of enamel on your teeth, and your eating, drinking and smoking habits. You can extend the results of your teeth whitening by not smoking, not drinking colored beverages such as coffee, red wine, soda pop and tea and refraining from eating staining foods like berries and pasta sauce. Additionally, drinking plenty of water and practicing good oral hygiene – which means brushing your teeth twice a day, flossing daily and going to your bi-annual teeth cleanings – can extend the length of your teeth whitening results. Are There Any Risks for Professional Teeth Whitening? Professional teeth whitening is a low-risk, painless procedure. But, you may find that your teeth are ultra sensitive or painful after teeth whitening. Don’t worry. These sensations typically go away within a few hours or days. As we’ve already discussed above, not everyone in Monrovia is a good candidate for professional teeth whitening. In addition to people with a thinner tooth enamel, pregnant or nursing mothers, patients under age 16 and Monrovia patients with certain oral health conditions, including gum disease, cavities or infections should not undergo professional teeth whitening. Many patients suffering from one of these conditions can undergo teeth whitening once their other dental issues are resolved. If you’re ready to take that next step to having a brighter, whiter more beautiful smile, call Dr. Q’s Monrovia office today at (626) 599-9818 to schedule a teeth whitening consultation. After Dr. Q performs a full oral evaluation and explains to you the professional teeth whitening process, her office will schedule a teeth whitening appointment for you.